So you are in Delhi or are planning to visit. If you are flying in from a foreign land I would recommend you get basics covered first. Have a pre-booked accommodation, get a sim and other things I wrote about (and I believe you did read that post). These posts started when I was reading up on the HOHO bus service in Delhi. These charge a minimum of 500 bucks for letting you hop on and off at predetermined tourist sites. You know me, the money sounded too much. Thankfully I have to pay 10 or 20 bucks to get inside those sites what if I were a foreign tourist! I can spend an entire day in Chandani Chowk and Red Fort with that kind of money. Some of the people I know have rooms cheaper than that. You would remember I wrote about my wish of starting walks ending with home cooked meals. While flying somewhere in my dreams, I tried to put a price on it. (Never mind the fact that I as always did not succeed. It will be a long task for me to even bend my mind around what I want to do for real.) HOHO was a pat of my research. 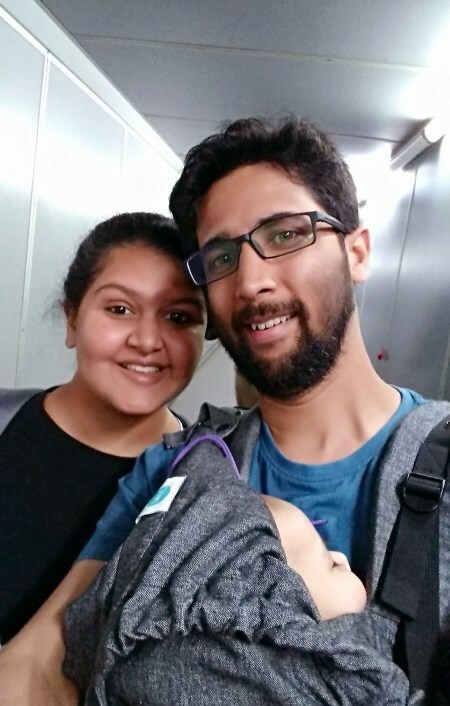 It resulted in this series of four posts which talk about seeing Delhi and its sites in four days. These are a few routes I love myself and would suggest people to take. As it is with any place you will need time to experience it especially if it is your first time in India. 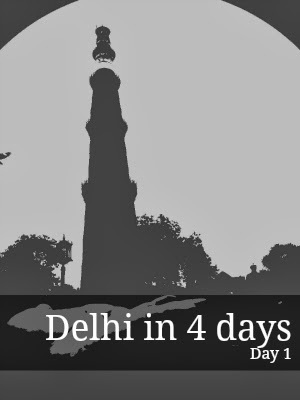 These four days will have a few overlapping places and the place you will see the most is Chandani Chowk. A market which offers great food, awesome shopping, biggest mosque of Delhi and Red Fort (UNESCO World Heritage Site) it features in all days. The reason I have it included in all days is because what if you wanted to skip those monuments and just eat your way through the city. Delhi Darshan and HOHO buses start at Connaught place. If you are staying cheap there is a big chance you are in Paharganj just 2 odd kilometers from the landmark. So for all four days we assume that the starting point is the same Connaught place or Rajiv Chowk Metro station and you start just after you have breakfast. Just a suggestion have breakfast at Rajiv chowk. Try parathas or patties form some road side vendor, you will be well fed in 20-30 bucks. I am assuming you are ready to buy a metro card or already have one. If you get a card deduct 10% from the travel costs at the end. If you don't you need to read mor eabout these cards here. If you think you can see over 170 identified monuments of Delhi in a week god bless you. 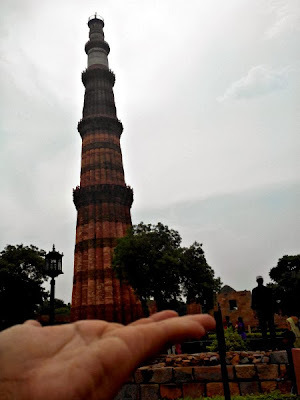 Most monuments in Delhi can take your entire day each or you could be done in an hour. Two which will definitely take a lot of time if you want to actually see them are Red Fort and Qutub complex. Both have long been symbols of Delhi and along with Jantar mantar and India gate in a day you would not want to add anything else at least I wouldn't. Walk to the LIC building. Its the red twin twin towers you see around you. A sort distance ahead is Jantar Mantar. Symbol of 1982 Asian games the complex has various instruments used for astronomical observations. These instruments are taller than most houses and not the usual ones we have. Walk around and read the tablets which tell you what each one of these was meant for. The Misra yantra which can predict when it was noon in any city of the world is a rare piece of mathematical intelligence. Its a combination of five separate instruments and is unique to Jantar Mantar in Delhi. Once you have been awed and climbed up and down these immense structures its time to take the metro. We are heading to Qutub complex first. The metro station though named Qutub minar metro station is a good two km away from the complex. You can see tomb of Balban walking your way to the complex or catch one of the shared autos which will drop you to the monument gates for Rs 10. If you are carrying any bags deposit it in the cloak room they are not allowed inside, no food either. Walk in with your tickets and see the famous qutub minar which declared a sultan's supremacy over Delhi. See the Iron pillar from 4th century and behind it Quwwat ul Islam mosque. Walk a bit ahead to see Alai darwaza, Alai minar and tombs of Iltutmish and Ala ud din khilji. Yup its a lot to see and even more to click. You should be hungry right now have some snacks because your ultimate food paradise is a bit away. Its time to board the metro again and this time get out at Chandani chowk. If you are hungry Chandni chowk will weaken your knees. Walk out and ask for Parathe wali gali. This narrow road probably makes more revenue and has more customers than any leading chain. Take a seat it doesn't really matter where and order a sweet lassi. It will be quick, delicious and will give you the energy to choose from the parathas they have. My recommendations papad ka paratha, matar paratha and gobhi paratha sum it up with khoya paratha which is a desert. You might feel like you are floating in heaven if you like spicy oily Indian food. Don't look around just eat and let your senses overtake your fear of oily food. not get lost its a straight road to Red fort complex. Get your tickets from the recessed ticket counter and again deposit your bags. 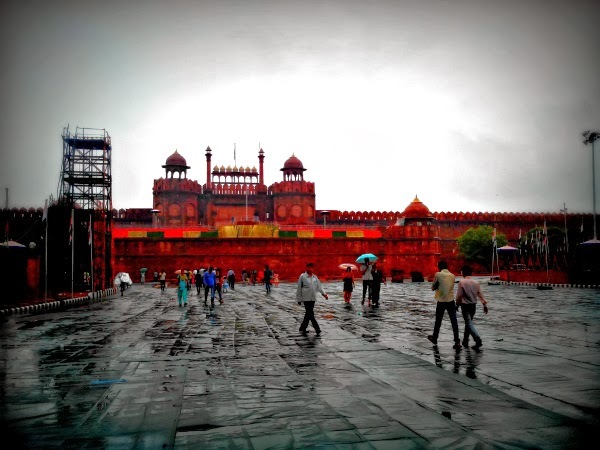 Red fort is very similar to Agra fort but has many more buildings and is much less symmetrical as it was built around an older fort. I love the walk around Diwan-e-aam. When you enter the fort there are a lot of souvenir shops avoid then you can get something much better if you take the shopping trip I am planning for you in my next post. 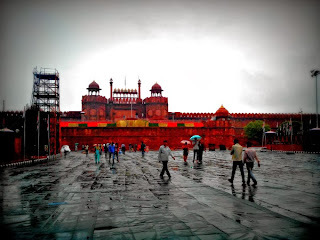 There are daily sound and light shows in Red fort, I haven't been to one. I have had a really good experience of such shows at Golkonda and not so great one at Agra fort. You are bound to be tired and its OK walk out and take a right instead of taking the road back to metro station. Soon you will see Jama Masjid. A beautiful mosque which draws many towards it and the lanes next to it are a trove of delicious muglai food. Pay your respects do remember to cover your heads. You might want to avoid going in if its Friday as there will be a huge rush. It should be sometime around five or six and its time to have some snacks, sample samosas or kebabs as you feel like. See and shop from the vibrant market where you can get anything. This market is a major wholesale for many shops in Delhi. Buy what you like never paying more than 50% of the original asking price. If you are still in this area till dinner which you would probably be walk into Karim's next to Jama Masjid. A meat eaters paradise they say nobody does meat better than Karim's. How would I know! They do good vegetarian food too. If you ware a vegetarian try Haldirams which is very close to the Chandani Chowk metro station. A warning while walking in the lane you might be greeted with sights of goat heads. It makes me squeamish at-least. Take a rickshaw back to Chawri Bazaar metro station and take the train to Udyog Bhawan metro station. Its time to visit India Gate. It is now house to Amar Jawan Jyoti a fire always lit in memory of those who laid down their lives for the country. The gate has names of those who died in the first world war. India gate is beautiful no doubt but what you want to do right now is feel the calm of Lutyens Delhi. It is a favorite evening hangout place for delhiwalas and it is up and running till midnight at-least if not later but public transport does not, so take care. Sample chuski and chaat as you lounge if its winters have sweet potato chaat and roasted peanuts. Restriction on gardens change every few days. The best thing this is free. Congratulations you have seen Delhi from the 4th century iron pillar, Khilji dynasty complex and have arrived in British Delhi through its Mughal counterpart. I really hope if you were looking for a day feeling Delhi this was helpful. If it is not these heritage sites and monuments that interest you maybe you would want to go shopping or eating. That brings you total to 79/- way cheaper than what HOHO would cost you or any other tour. If you want a guide then the equation would change. Audio guides are available at all the monuments and plaques are written in Hindi and English. I have deliberately left out Humayun's Tomb for this day. A symmetric garden tomb it is a beautiful site to behold but that is when we visit Nizamuddin Dargah that we visit the tomb after all today is not our last day in Delhi. Would you like to add anything to the itinerary?